Often musicians overreact to the musical intentions of a composer, or to conductors and teachers attempting to get specific results. In soft passages, perhaps players restrain themselves with muscular tension instead of maintaining ease in their bodies and using the techniques required by their instruments. Over time, these kinds of overreactions can develop into habits of misuse, and layers of tension may cause players frustration and even injuries. 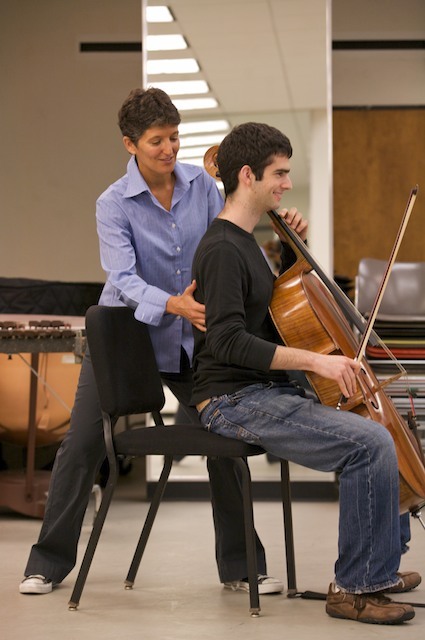 At these times, musicians turn to Lori Schiff, full time professor of the Alexander Technique at The Juilliard School. The Alexander Technique is an educational method developed in the 1890s by Australian actor Frederick Matthias Alexander, who, while trying to recover his own voice when doctors could not help him, found the reason for his problem was excessive tension in his neck and body. He also discovered that when he changed his mental and physical habits, the problem disappeared. “If musicians wish to change the way they play, thinking in the activity of playing and regulating how they use their whole body is absolutely essential,” wrote Schiff. For example, a violinist lifts the violin and bow to play and often does not think much about this automatic action. But this action may be using much more effort than is required. It may be a part of a total pattern of movement where, perhaps, the person leans a bit into the lower back while rolling down a bit in the thoracic and upper parts of the spine, so as to compress the neck. These reactions cause a series of imbalances in the body that then can cause a series of compensations in order to meet the requirements of playing the violin, Schiff explained. The body is an instrument and Alexander Technique is a method for using it well. But if the violinist follows Alexander Technique, he would pause before lifting the instrument. He would allow the body to rebalance through releasing excess tension in the neck and back and then direct the actions of lifting the instruments in such a way that the movements would become more efficient and unhampered by imbalances. “It is a constant mind-body awareness and direction of the self. The body is an instrument and Alexander Technique is a method for using it well,” Schiff said. The lack of knowledge about the connection between mind and body, as well as how the body works, is a major reason many musicians end their career or feel physical discomfort, said Robert Rickover, a teacher of Alexander Technique in Lincoln, Nebraska. For example, a lot of people think that their elbow is a hinged joint, like a door, but if you explore it, you’ll notice your forearm can rotate 180 degrees, which one cannot do with a door, Rickover explained. So if string players have such an idea, then they’re going to severely restrict movement possibilities in their bowing arms, and they’re going to bow with more strain. 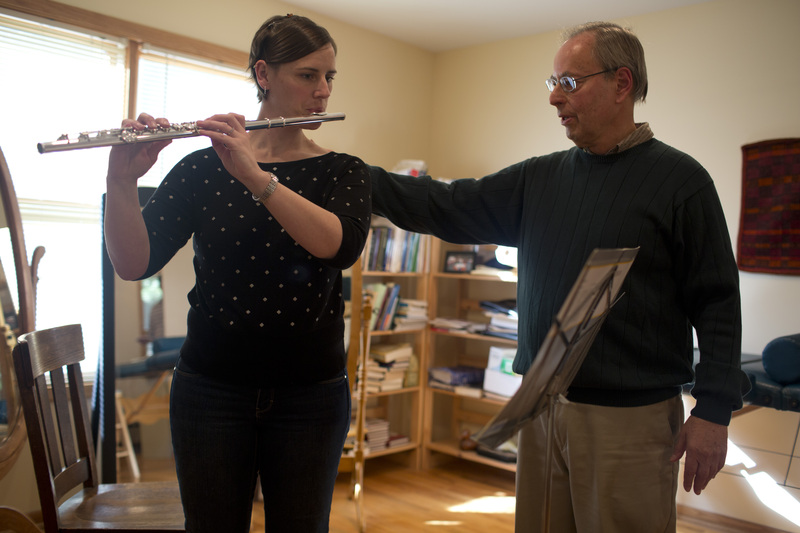 “If a musician practices 7-8 hours a day with that same basic movement, his arm can freeze up. He can stop being able to play that instrument,” Rickover said. Any division between how one thinks a joint works or where it is located, and how it actually works and where it is actually located, will set up a battle in the body and lead to extra tension. If a musician practices 7-8 hours a day with that same basic movement, his arm can freeze up. Rickover also points out that most people have the idea that if something is wrong, they have to fix it by doing something else. With the Alexander Technique, on the other hand, you have to figure out what is causing the problem and learn how to stop doing it. “The biggest challenge for people learning the Alexander Technique is trusting that all it takes is a light thought to change a physical pattern,” Rickover said. 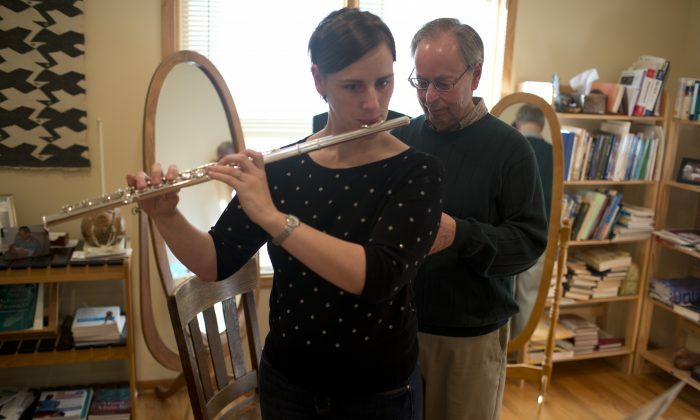 For Laura Medisky, oboist and Alexander Technique teacher in Madison, Wisconsin, learning the method was a life changing experience. She admits to being a great success story. 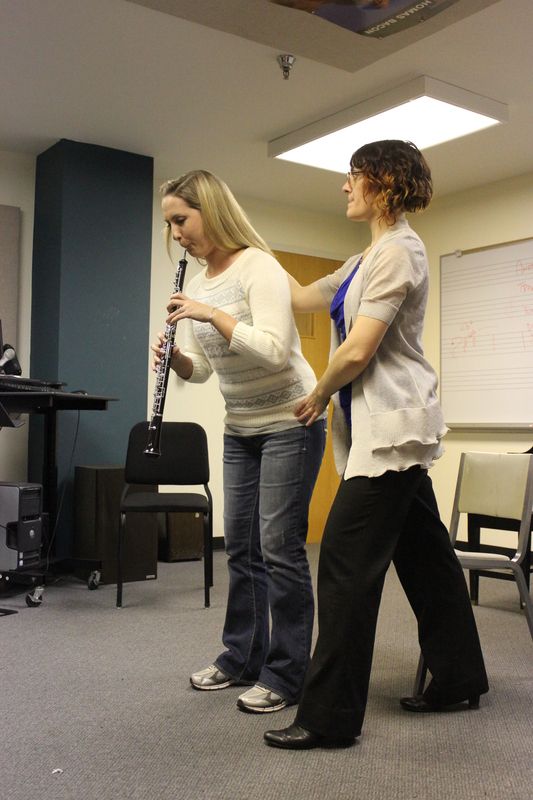 As a young music student, she had debilitating and career-threatening pain, but is now a professional musician with a terminal degree, thanks to the Alexander Technique. The biggest power of Alexander Technique lies in habit changing. She understands that changing habits might be disconcerting and even disorienting to a musician who has done something the same way for a long time. “I emphasize that these habits can be flexible and should create opportunities in our playing rather than get us stuck in a rut. Medisky also invites students to use verbs such as “notice,” “explore,” and “allow” when approaching their instruments. By advising students to pause, think, redirect, and execute, she is asking them to inhibit habitual patterns and create new ones. “The biggest power of Alexander Technique lies in habit changing,” wrote Medisky.